I replaced the transmission mounts on my '89 S4 Auto last weekend. Both had lost their elasticity and were sagged about an inch (see photo - old on left, new on right). The bolts holding the mount to the crossmember were relatively easy to reach and remove. A 19mm socket and breaker bar loosened them quite easily. 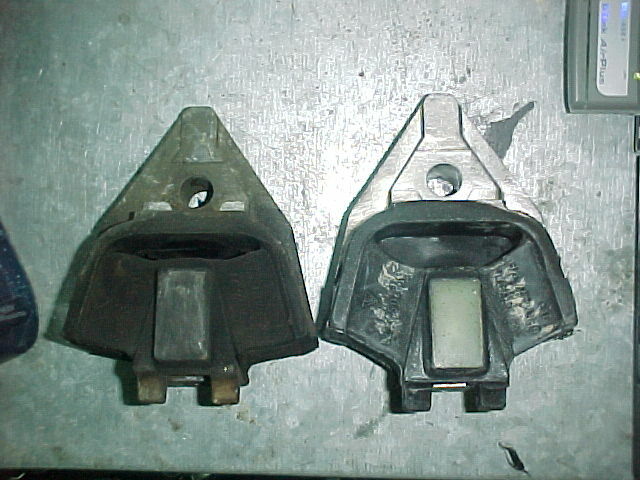 The upper bolts holding the mount to trans. were a different story. Left side was not as hard as right because I could get a socket on it by reaching around the tail pipe. Not much clearance between a body flange/tab and the bolt head, but just enuf to slip a shallow socket on it. Breaker bar had about 3" travel, but it was sufficient although very awkward to do when on my back. On the right side, I had to remove the tail pipe-to-resonator clamp, then loosen the tail pipe at the CAT & swing the pipe down and away from the trans (pic) in order to get a socket on the mounting bolt. Once that was done however, it was pretty easy. I cleaned up the bolt head flats with a file & spread a nice layer of anti-sieze on the threads. I did manage to get my shorty torque wrench in position & torqued all four to spec - 61 ft/lb. Did I notice a difference? You bet! My driveway has a slight incline & I would slow nearly to a stop when turning into it. When I then applied a little pedal, I could feel a low vibration at the rear until I was nearly level again. Now that vibration is gone. In addition, the driveline feels a lot smoother when pulling away from a stop sign or light. New mounts were $72 each from 928 International. 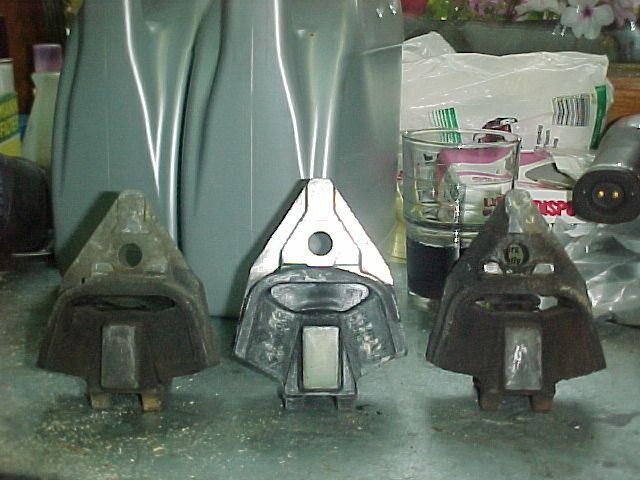 I just replaced the transmission mounts on my 90' S4 Automatic, well actually last weekend. Mine were original, but not fully compressed like those shown in the photo above. I did notice that now the transmission doesn't bottom out over bumps like before. So, I'd say it's a big improvement in the smoothness of the ride. With an inspection mirror, you can visually inspect loaded mounts for clearance between the upper aluminum bracket and the rubber bridge. The photo above shows a totally collapsed mount along side a new one. Before installing the new mount, I had assumed that the bottoming out noise over bumps was normal. It wasn't a metal to metal noise, just a thud. Like Jim B says, it's a pretty heavy transmission and drive line. I had no shims on my GTS before. 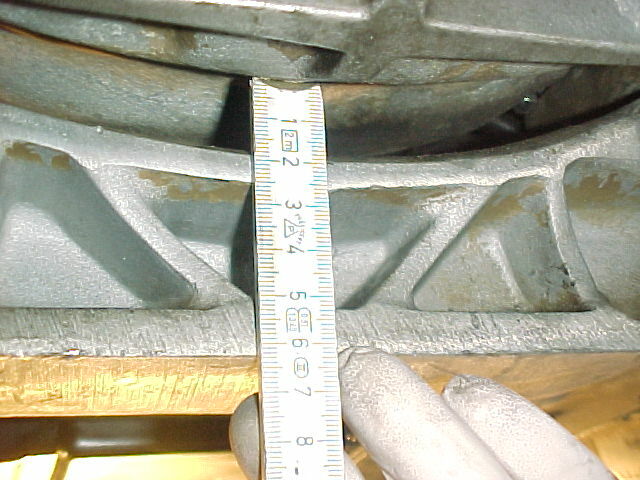 That's probably the reason why my old driver side mount was 4 mm shortet than the passenger side. But when I installed the new mounts I had to use shims to spread the weight evenly. Driver side 1 mm and passenger side 4 mm. I used shims from my local hardware store. One my third attempt at this job I finally succeded. The rather expensive Crows Ring spanner was no help at all. In the end the only way I could get enough leverage on the ring spanner was by undoing and tying the half shafts out of the way. The six bolts on each flange take me about 5 mins each to undo and another five to do back up again, so that's where 2 hours went. Then to break the top bolt free on one side I used the hydraulic jack against the spanner. On the other side I used a two foot extension. Space is so limited that I found I had to use my fingers to remove and re-instert the bolts, although I did manage to use a gear-wrench on one side. There were no shims on mine and the mounts looked pretty similar to David's, with the addition of a thick coat of oil and dirt. I'd rate this job as tedious and tiring, with no guarantee of success. My workshop manuals don't have a page 34-8a. In mine I found the procedure on page 37-123. 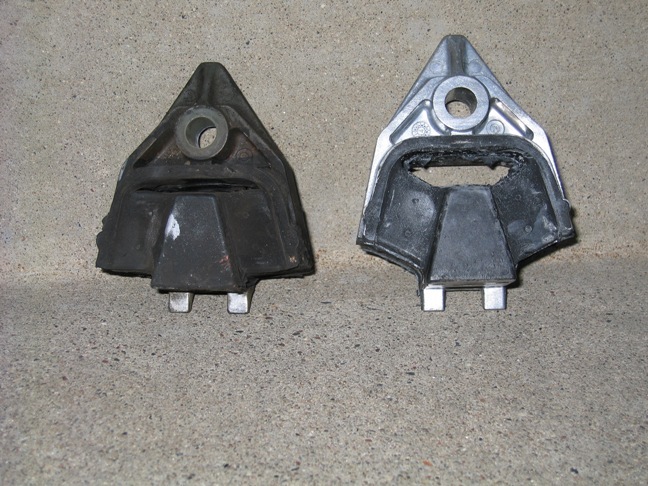 Oh, and 928 International sells those mounts for $75 each. 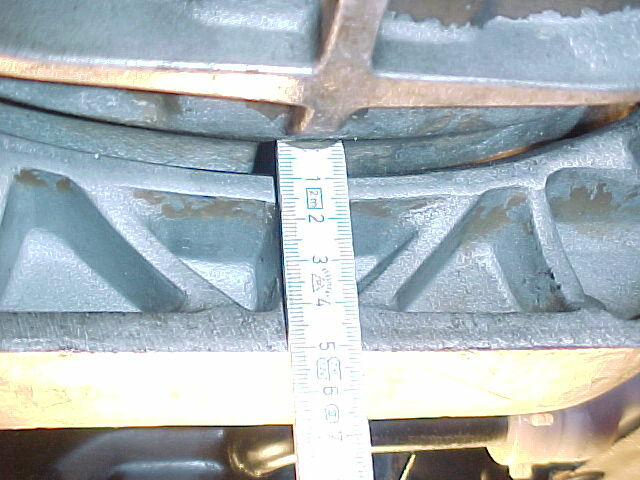 Mine had shims to adjust height. Check the WSM. I didn't put them in with the new mounts because, well I was putting in new mounts. Got a serious vibration under hard acceleration. Used some washers from the hardware store to restore the spec'd distance. All is good.